Back in March I wrote about a burn-in problem I was seeing with my Dell S-IPS LCD monitor. I got varying reports on the web on whether this was likely to be a temporary or a permanent problem; so here's an update six months later. The problem I noticed back in March was that my xchat window, always positioned at the same spot on the screen, was getting burned into the monitor. Against a blank white or grey screen, I could clearly see where that window's titlebar normally was, and rows of horizontal lines where the text was. First, I changed my ways to avoid having windows in the same place all the time. I changed my window manager settings to remove most window placement settings, I removed directives to show any windows on all desktops, and a worked on developing a habit of moving windows around periodically to slightly different locations (I think I'll have my Firefox window on the upper right this afternoon). I don't really like that -- I guess I'm enough stuck in my ways that I like knowing that I can look to the upper left for web pages and the lower right for IRC -- but it's not that bit a deal. And, happiness, my burned in xchat lines went away. My old bad behavior had not permanently burned in the pixels on my nice monitor. But that's only part of the story -- because if you look at the photo from March, xchat is not all you see that's burned in. There's also the wavy stuff going across the lower 1/4 of the screen -- and that didn't correspond to any window I'd been running. These patterns, unfortunately, are not going away. In fact, the ones along the top and bottom left edges are pretty clearly getting worse, and eventually, alas, I'll probably have to replace the monitor. But meanwhile, they vary a lot. When I first turn on the monitor in the morning, most of the time I can't see the burn-in at all. After a long day of use, it's usually pretty obvious. In between, though, there's huge variation. Sometimes they appear after an hour of use; sometimes I can go most of the day before the burn-in starts becoming visible. It doesn't seem to be particularly temperature sensitive, and it doesn't seem to vary much with which background image I'm using that day. Sometimes when I'm going to be away for a while, I display an all white screen -- I've read a few reports indicating that can help, and anecdotally I think it does. I should probably keep better statistics on temperature, background color and time to find out what's really affecting this. Maybe I could use it as a homework project in the new Linuxchix R/Stats course! Update: Two days after I wrote this article, the patterns were unusually bad starting first thing in the morning, and stayed bad all day ... then at about 7 in the evening, as I typed away not doing anything special, over a period of about 15 minutes they disappeared almost entirely. Quite mysterious! LCD Burn-In, er, "Image Persistence"
Mostly, I love my Dell 2005FPW S_IPS monitor. Nice colors, sharp image, incredibly w ide viewing angles. But one thing made me uneasy: while working on a smooth gradient in GIMP, I noticed some funky pixels in the bottom right of the screen, where I could see horizontal bars where the image clearly didn't have them. And if I moved the image, the bars stayed put. Oh no! My lovely monitor maybe wasn't so lovely! Since then I've been pretending not to notice (I bought the monitor used, so warranty return isn't an option). But yesterday, I maximized Firefox on a page with a medium cyan background -- and that barred area was a lot worse. In fact, it was so much worse that I could see detail in it: it was my xchat window. I could even read some of the menubar items. It's an LCD! They don't get burn-in ... do they? Well, yes, it turns out, they do. Only it's not called "burn-in", it's called "image persistence". And for some people, it happens very quickly, while other people never see it. Anecdotally S-IPS monitors seem to show image persistence a lot more easily than TN monitors, but nobody seems to know why. 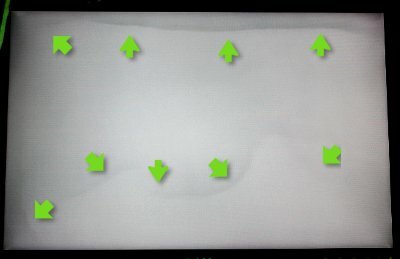 On my monitor, about an hour and a half of all-white made it better, and after turning it off overnight, the next morning I could no longer see any trace of the persistent image. Update two days later: Strangely enough, although the pattern seemed completely gone the next morning, that evening it returned, even though I hadn't had any window at all in that space all day. I gave it another hour or two of all-white over that area, then its usual evening of rest, and the next day it was gone again and stayed gone this time. At least, it's evening now and it hasn't returned yet. So I guess I need to change my habits. I already use power saving mode so the screen sleeps when I'm not there (no screensaver); but on the other hand I'm at the machine day and night, and I like to keep windows in the same place. How do you invert the screen? You'd think there would be a gazillion programs to do that on X, but there aren't. You can compile a C program called sgamma then run sgamma -b -1 to invert, and sgamma -b 1 to restore. It restores to full brightness, though, so if you've changed your brightness using a program like xbrightness you'll have to adjust it again afterward. Alternately, Guillermo showed me a nice little C program called invgamma, by Ben Winslow, that just inverts whatever gamma curve you already have (run it again to undo the effects). Ben doesn't seem to have a page for it and it doesn't have any license info in it so I can't put it on my site either, but if you google for it you'll probably find a copy. I'm a trifle bummed that the whizzy S-IPS monitor turned out to be so delicate. But I suppose it's good to change habits now and then anyway and not get too stuck on particular window positions. Maybe it'll help keep my brain from burn-in too. 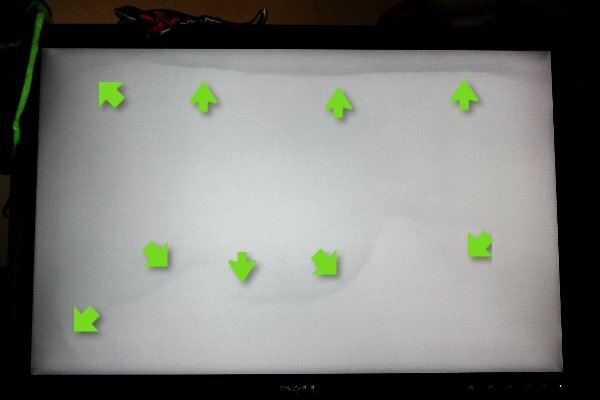 I wrote an update, 6 months later, with more details: LCD monitor burn-in, revisited.